By Johanna Goldberg, Information Services Librarian. 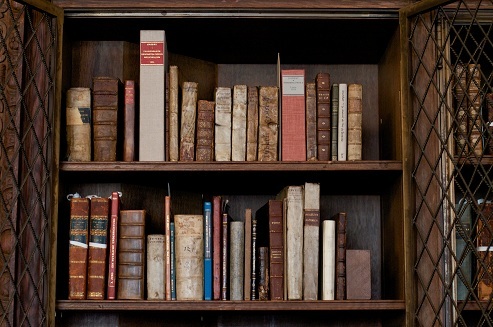 Photographs by Library staff. The box of Place’s photographs. 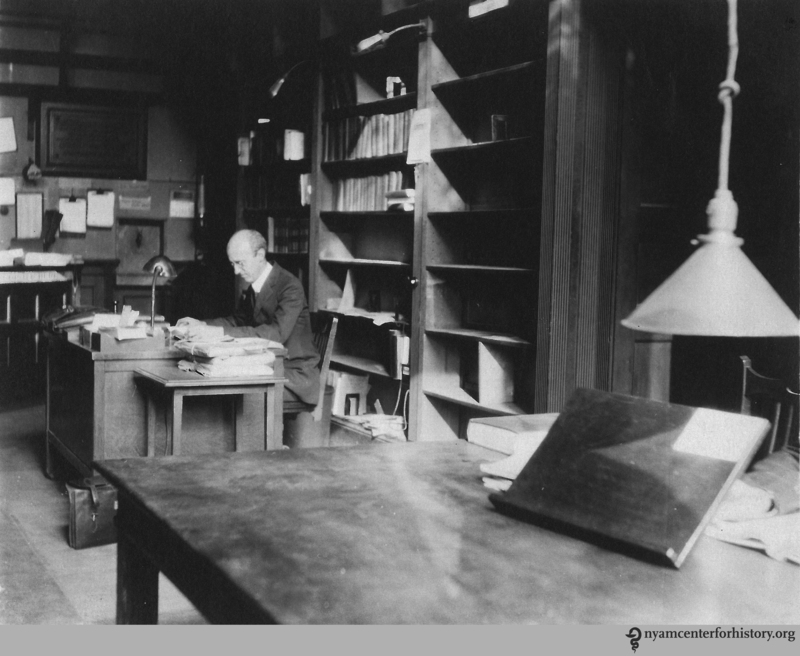 Frank Place worked as a reference librarian for the New York Academy of Medicine library for 40 years, from 1905 until his retirement in 1945.1 He was at the Academy when it was located at 17 West 43rd Street (its home from 1890), and documented its move in 1926. He took pictures of Central Park, of staff working and relaxing, and of spaces inside and outside the current and previous locations. 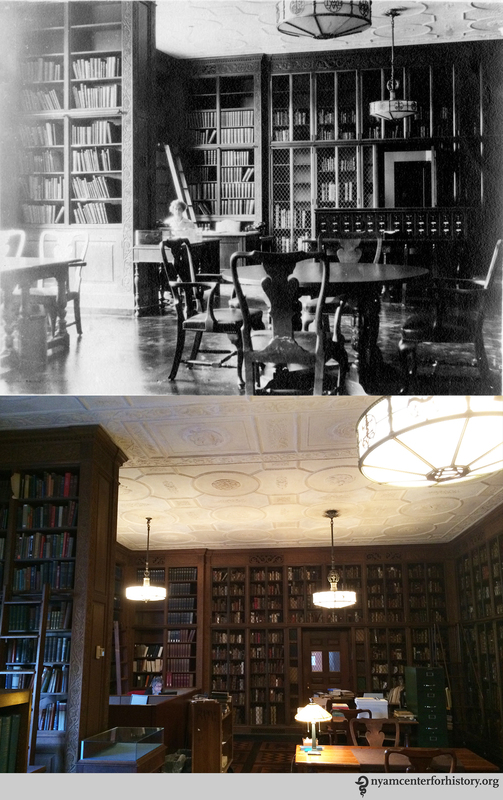 “Frank Place in reading room as moving was going on,” 1926, 17 West 43rd St. 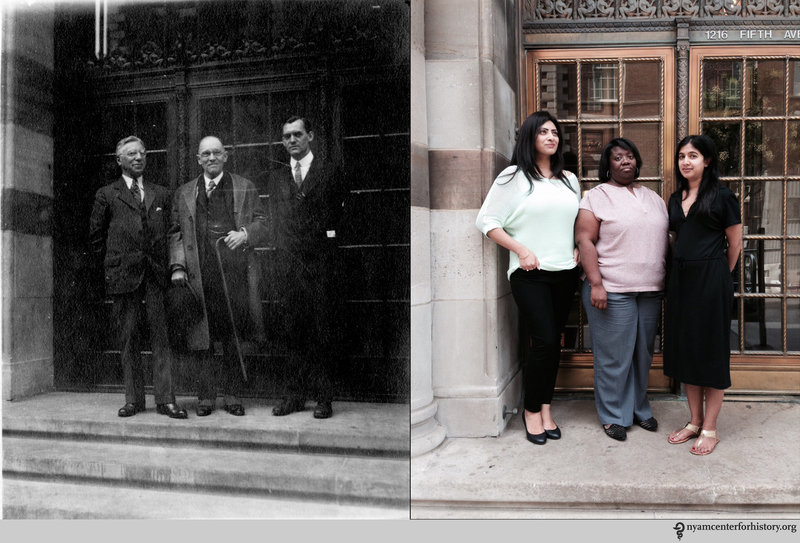 In celebration of Frank Place and library and Academy staff past and present, we have recreated a few of Place’s numerous photographs. We could not always take pictures in the original locations—Place took one of the selected pictures at 17 West 43rd Street and several office spaces have been renovated since his time. 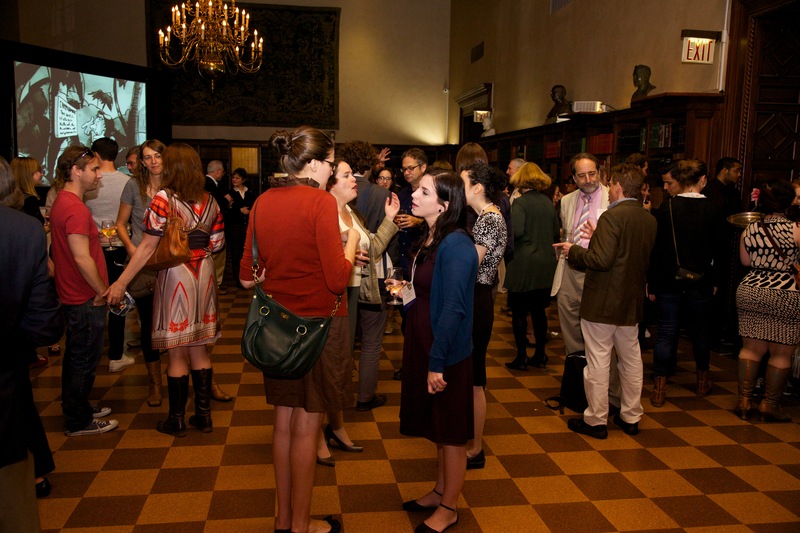 But we attempted to capture the essence of the photographs and honor Place’s documentarian spirit. If you know the full names of anyone unidentified or incompletely identified, please let us know. 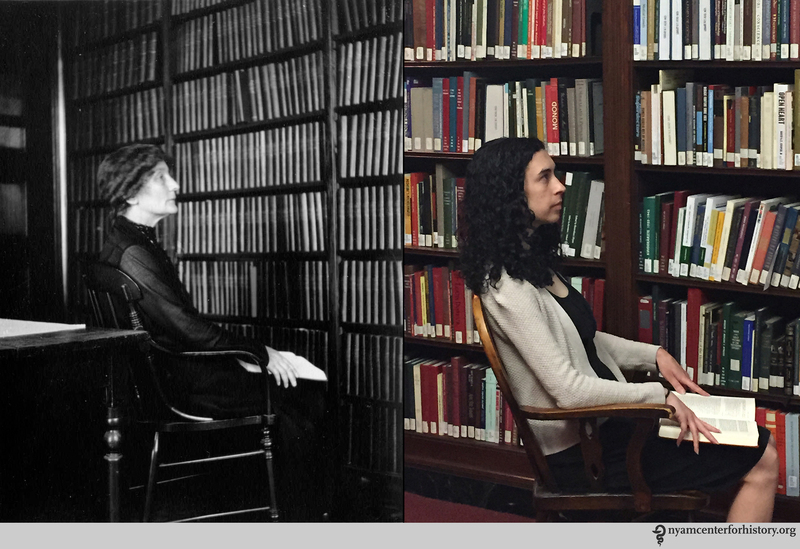 Right: Johanna Goldberg, Information Services Librarian, July 16, 2015. Left: “F. Kinsley among duplicates,” 1926. Right: Danielle Aloia, Special Projects Librarian, among duplicates, July 7, 2015. 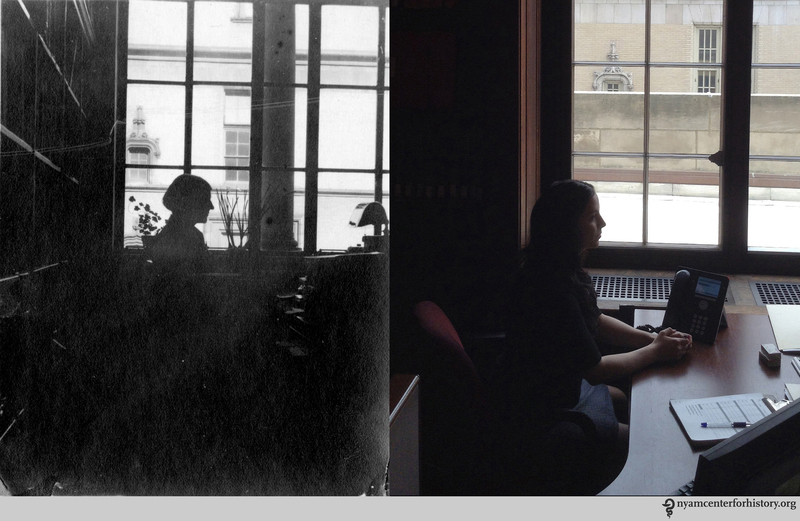 Left: Florence Duvall, Head of the Cataloging Department, February 13, 1929. 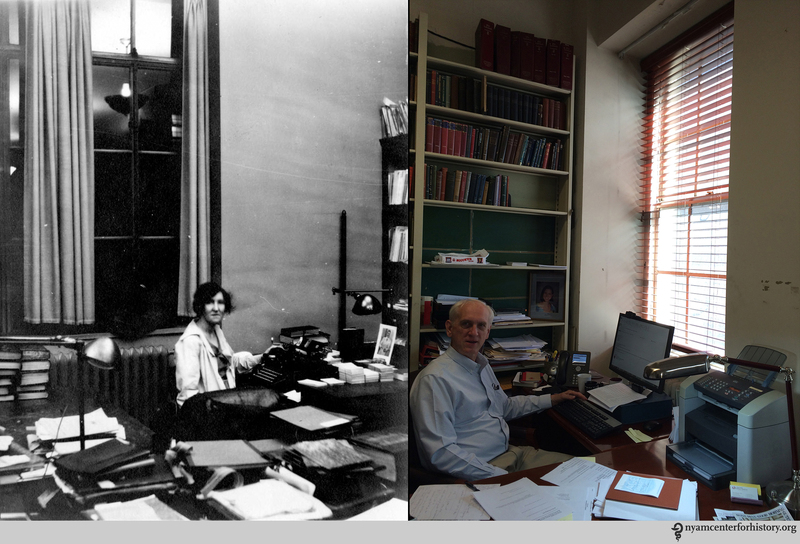 Right: Rebecca Pou, Archivist, July 7, 2015. Left: “A. White, maybe 1932.” Right, Paul Theerman, Associate Director, July 16, 2015. Top: Helen Field in the Rare Book Reading Room, July 1933. 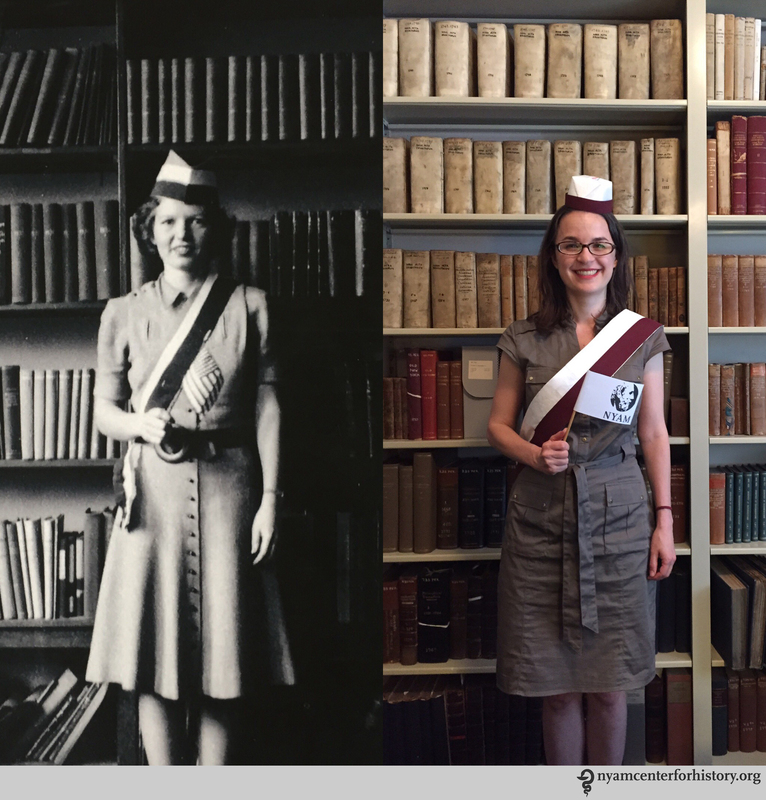 Bottom: Arlene Shaner, Historical Collections Librarian, July 16, 2015. Left: E. W. Evans, April 11, 1941. 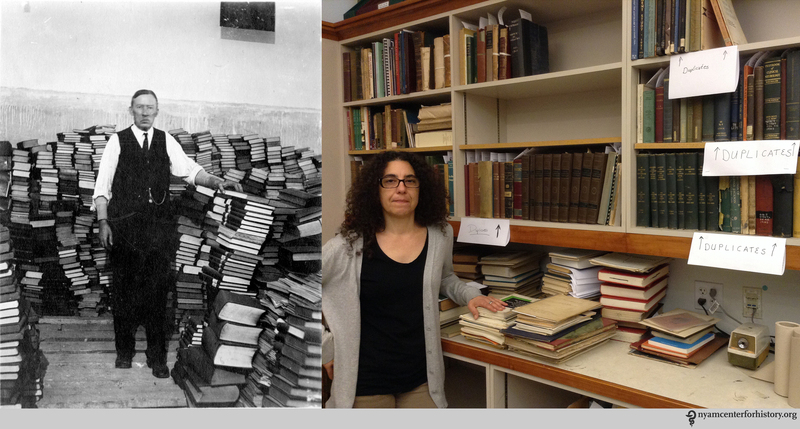 Right: Christina Amato, Book Conservator, July 23, 2015. Left: M. Schieck, A. Larsen, M. Roberts, Helen Field, October 1941. Right: Emily Moyer (Collections Care Assistant), Kate Bator (Past Collections Care Assistant), Erin Albritton (Head of Conservation), and Christina Amato (Book Conservator), July 22, 2015. Left: Helen Field, March 1942. Right: Robin Naughton, Digital Systems Manager, July 16, 2015. Top: M. Roberts, March 1942. Bottom: Anne Garner, Curator, July 7, 2015. Left: “Westrom Dr. Clouting Maddocks.” Felix Wesstrom worked at the Academy from 1893–1935. 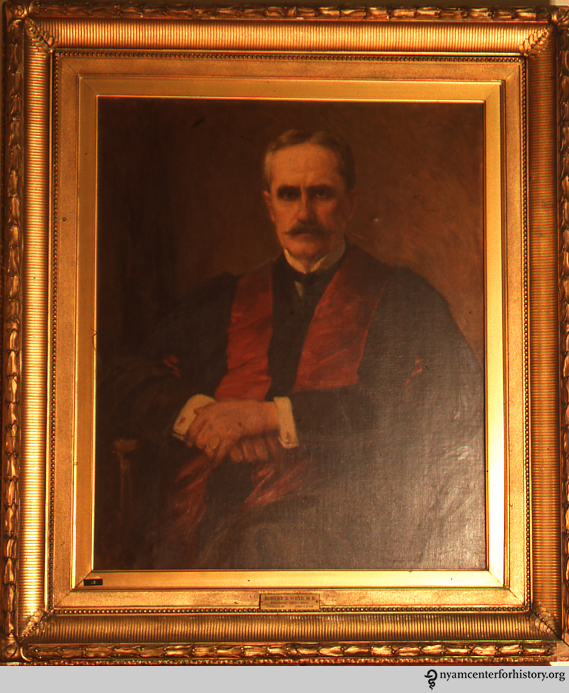 He started “as an elevator boy, became janitor, and had done almost every kind of service in the forty-two years he served the Academy, including a brief period of collecting dues.”1 Harold Maddocks was the superintendent of the building.4 We were unable to uncover significant information on Dr. Clouting. 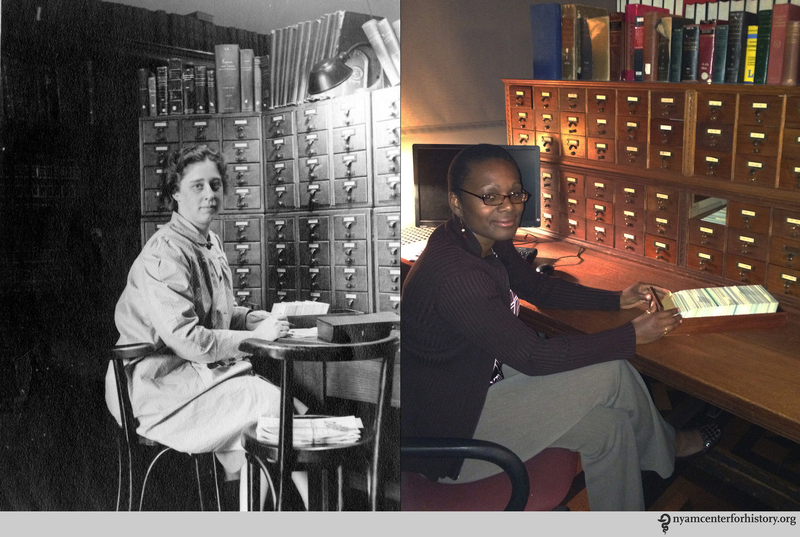 Right: As the original photograph features non-library staff, our recreation does the same. Left to right: Suhani Parikh (Coordinator, Office of Trustee and Fellowship Affairs), Tammy Cowart (Payroll Coordinator, Business Office), Sejal Gandhi (Director of the Education & Conference Center), July 28, 2015. 1. 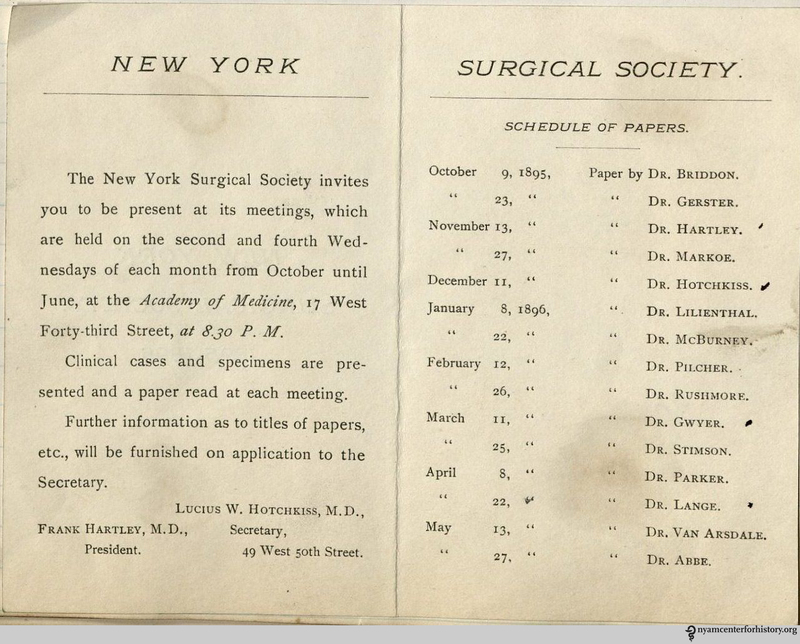 Van Ingen P. The New York Academy of Medicine: Its first hundred years. New York: Columbia University Press,; 1949. 2. Place F. Records off the Record. Bull Med Libr Assoc. 1944;32(2):214–6. Available at: http://www.pubmedcentral.nih.gov/articlerender.fcgi?artid=194346&tool=pmcentrez&rendertype=abstract. Accessed July 29, 2015. 3. Bryant WS. 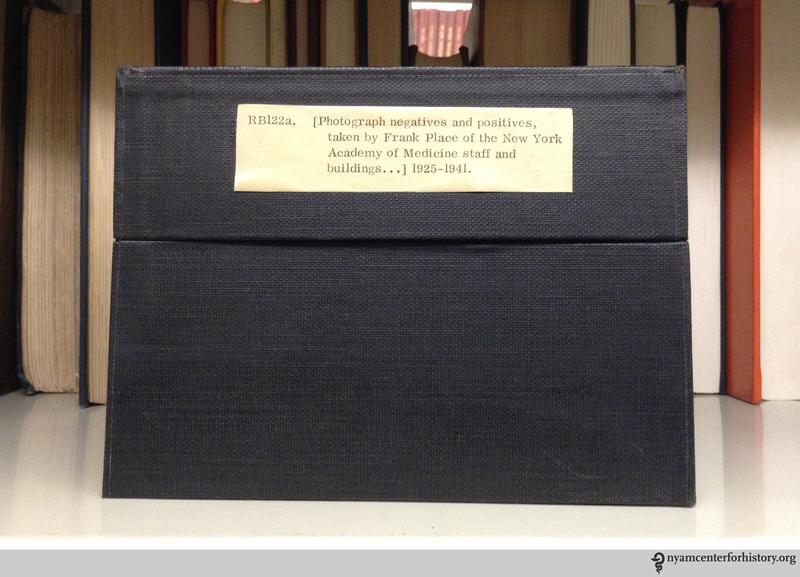 Felicia Autenried Robbins, M.D., 1869-1950.; 1951. 4. Annual meeting. N Y State J Med. 1933;33:538. It’s hard to pick highlights, although of course Dr. Oliver Sacks speaking about his intellectual influences and the patients who inspired his Awakenings was hugely exciting for all of us. We are grateful to Dr Sacks and all the speakers who came and shared their knowledge. Our guest curators did an amazing job. 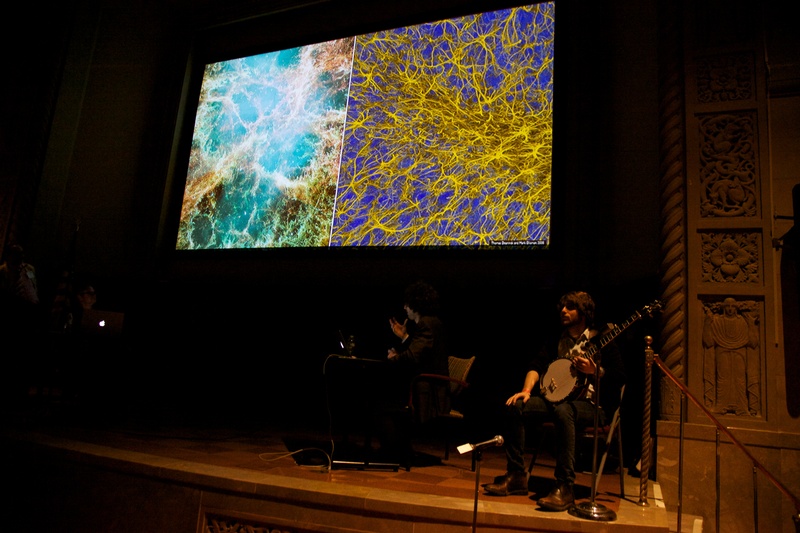 Lawrence Weschler’s Wonder Cabinet started with a (big) bang, a banjo-accompanied cosmic/neuronal slapdown, and ended with fascinating insights from Riva Lehrer into how an artist’s body can affect her art and her anatomy teaching. In between, spectators had the chance to get a glimpse into the experience of having an epileptic fit; share anatomical adventures; and witness some cringe-inducing treatments suffered by monarchs through the ages. The cosmic/neuronal smackdown. Photo by Amy Hart. Joanna Ebenstein’s Morbid Anatomy presentation of 12(!) talks throughout the day were standing-room only, forcing us to move to a larger room, which filled up just as quickly. 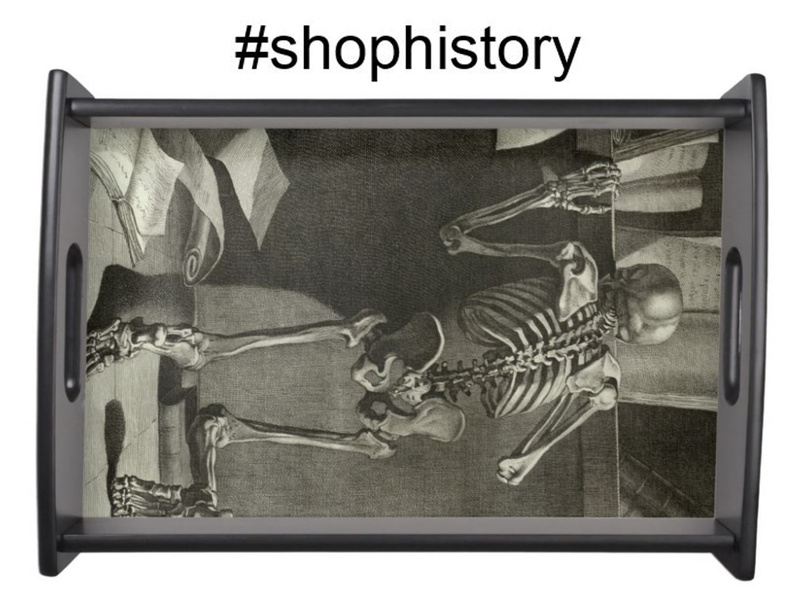 The day started with Mexican traditions around death, took a detour to human zoos, wax anatomical models, medical library pleasures, memento mori, and skull theft before ending with the little-discussed practice of bookbinding with human skin. Sigrid Sarda gives a medical wax moulage demonstration. Photo by Amy Hart. Our conservation team prepared a wonderful exhibit of models demonstrating development of the book over time (no human skin involved), as well as a whimsical look at the life of miniature books. 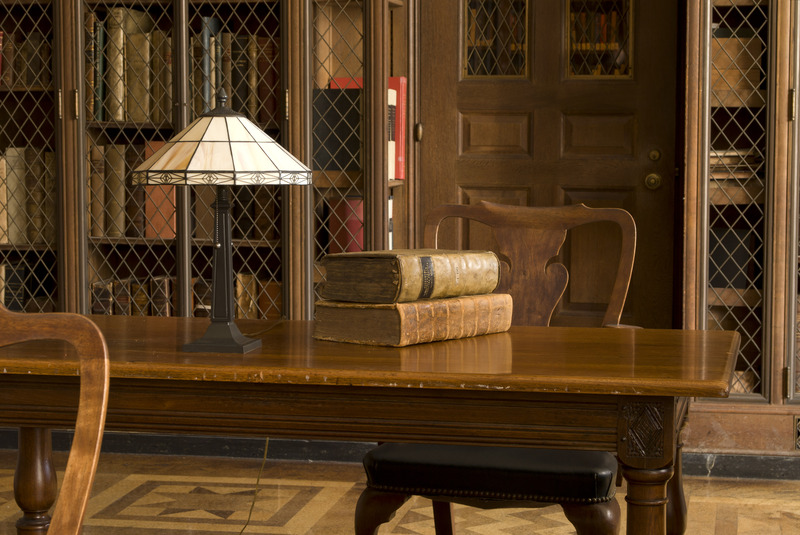 We put highlights from our collections on display, and welcomed visitors to our conservation laboratory. Meanwhile, visitors could learn the art of making anatomical wax moulage and see Gene Kelly struggle with combat fatigue. And the after party cocktails and cartoons were just the things needed to wind down after the long day. Cocktails and cartoons at the after party. Photo by Amy Hart. With so many people, some events did fill up. Particular apologies to those who couldn’t make it on a behind-the-scenes tour. With such overwhelming demand, we’re planning to make them a much more regular feature, so if you missed out you’ll get another chance at a future event. 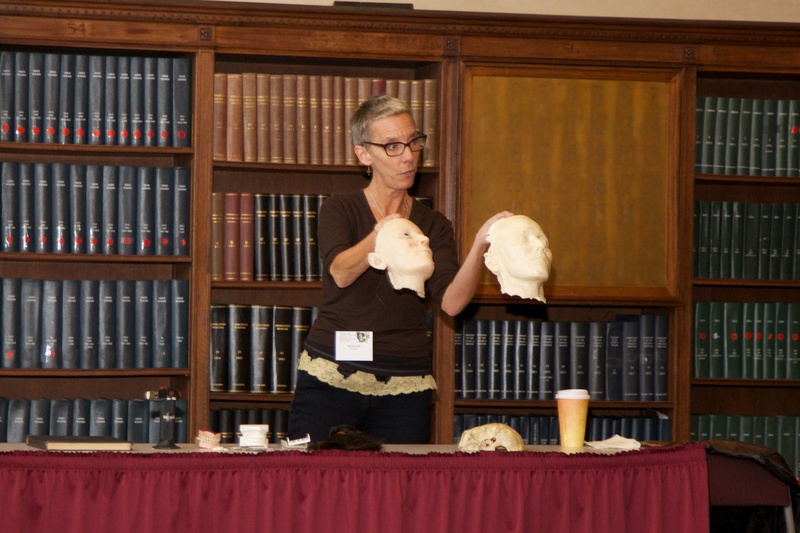 Our two anatomical workshops were also full; for those of you in New York, we are investigating offering courses on a more regular basis, so please let us know if you are interested! 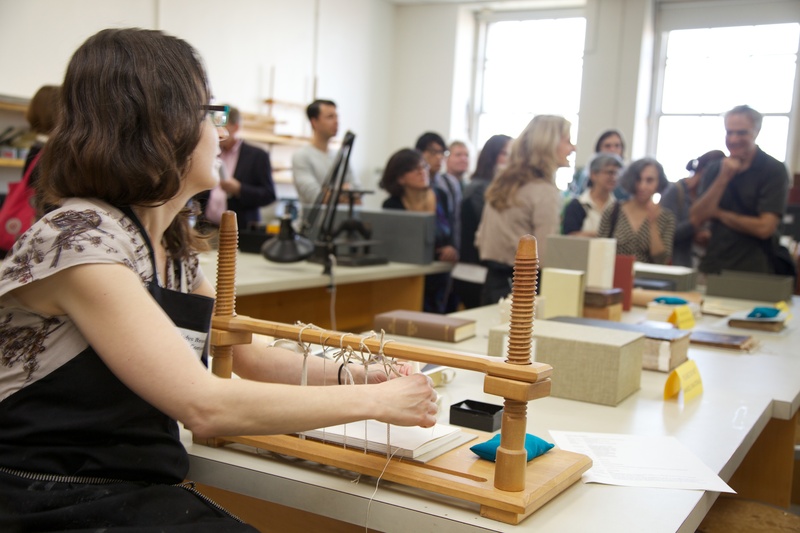 A tour of the Gladys Brooks Book & Paper Conservation Laboratory. Photo by Amy Hart. Pictures from the day are up on our Facebook page, and winners of the caption competition and the raffle will be announced soon. Meanwhile, keep an eye out for more details of our Performing Medicine mini-fest, coming in the spring. Hope to see you then, if not before for some of our stand-alone events!